Home / Nature / Shake Them ‘Simmons Down! The persimmon is one of our finest wild fruits. Late fall and early winter is the best time to gather them. The key to fine persimmon cuisine is gathering them when they are ripe. When a persimmon is a rich orange color, round, plump and firm it is NOT ripe. A buxom young fruit like this will pucker you up but quick! If you taste a persimmon at this stage, its astringent flesh will make your mouth feel like it is filled with cotton. Like a lot of us humans, it takes age and maturity to sweeten this fruit. When the skin gets wrinkled and it begins to look a little saggy, it is then that the persimmon is in its prime and will melt in your mouth like a spoonful of smooth, sweet apple butter. Some folks say that persimmons don’t ripen till after a hard frost but this is not necessarily so. Individual persimmon trees seem to keep their own schedules. I know some trees with persimmons that are ripe in September, weeks before a frost, and others with fruit that is not ready till Christmas. 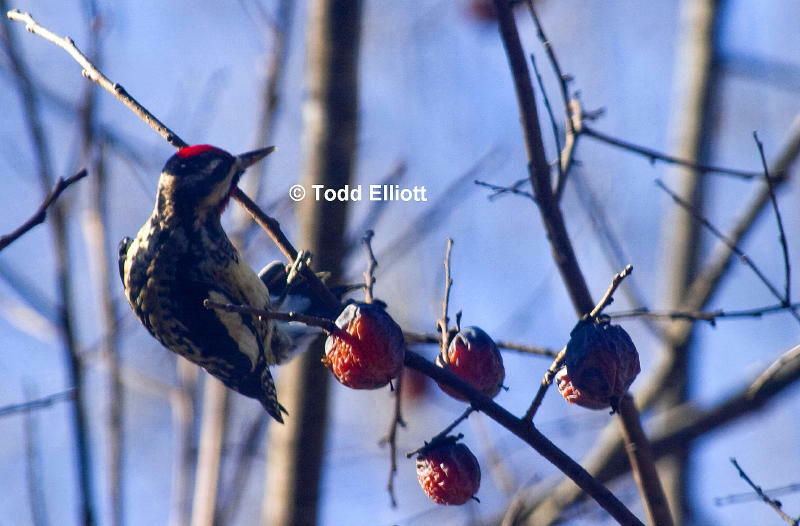 There is a tree right out our window whose persimmons hold tight till February and March and becomes a bird feeder attracting cardinals, sapsuckers and other birds who feed on the fruit. The easiest way to pick persimmons is to gently shake the tree and the ripe fruits will fall. Gather them in a flat bottomed container trying not to pile them more than two layers deep so they won’t mash each other. (This mushiness is why you never see our native persimmon in the market. ) They can be kept in the refrigerator and eaten out of hand or they can be made into a number of tasty dishes. Remove the seeds from the pulp by running the fruits through a Foley food mill or a colander. The pulp can be used in many ways. It can be stored under refrigeration for a week or two and used as a spread for bread or a topping for ice cream. It can be swirled in a parfait glass with whipped cream to make an elegant dessert. It can be used instead of bananas in your favorite banana-nut bread recipe to make persimmon nut bread. (If you can use wild hickory or black walnuts, all the better.) To make persimmon leather, spread the pulp on a greased cookie sheet and place it in a food dehydrator or a warm oven or other heat source until completely dry. 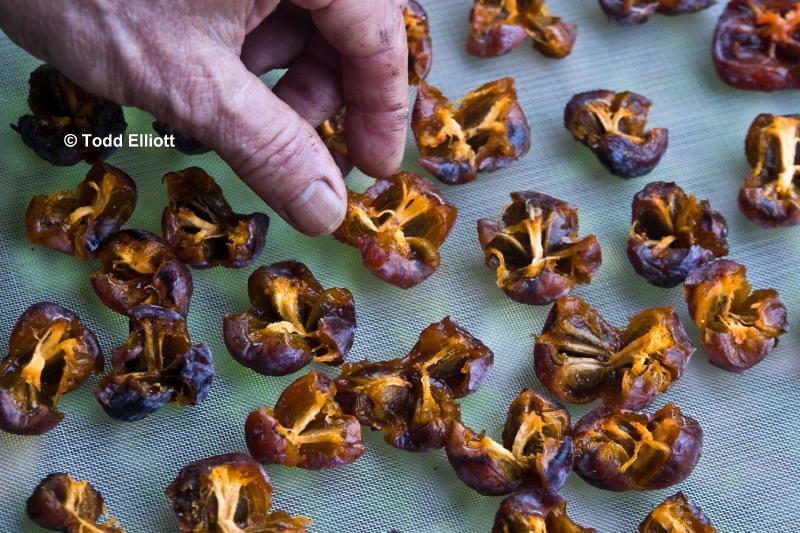 They can be dried whole by opening them up and spreading them on the drying rack. Can you see the knife, fork, and spoon in the three opened seeds? Looks like we’ll have a mixture of cold, warm, and snowy weather this winter! 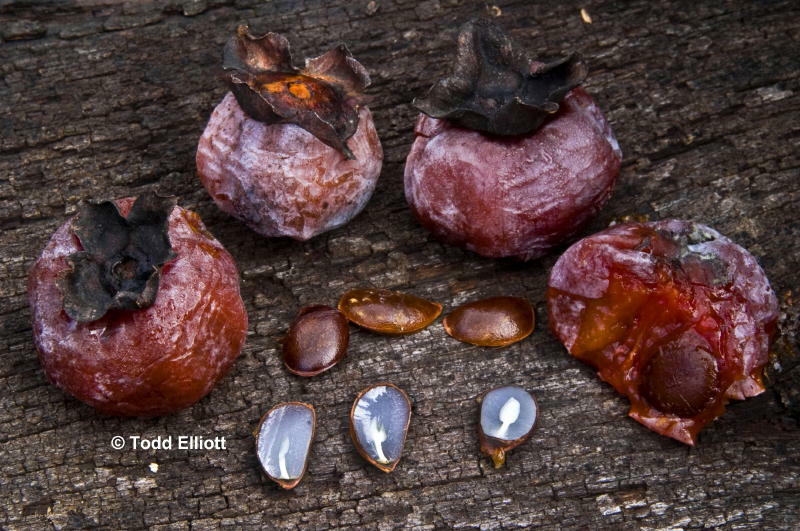 Don’t throw away all those persimmon seeds either. Wash the remaining pulp off and roast them in a medium oven until they are very dark brown. Grind them in a blender and you have persimmon seed coffee. Prepare it as you would regular coffee. It has a rich coffee-like flavor but no caffeine. 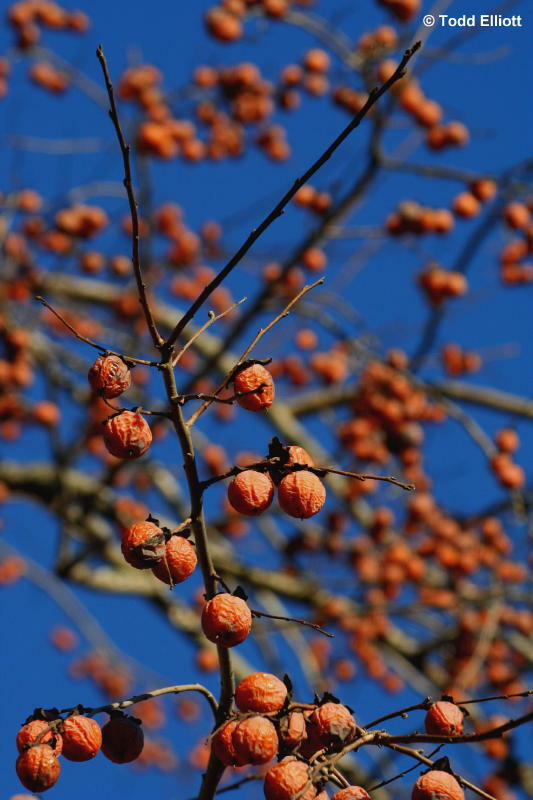 If persimmon java is not your style you can also use a persimmon seed to predict the upcoming winter’s weather. All you need to do is carefully slice one of the seeds in half with a sharp knife and look inside. You will see either a knife, a fork, or a spoon. The knife indicates the cold will be so intense it will cut you. The spoon tells you that there will be enough snow that you will have to shovel it, and the fork indicates the weather will be warm enough to make hay all winter. Next post: Cut It Out! Hi Doug, just signed up for email alerts. Posted your blog site on a friends blog http://www.ruthholladay.com, a retired columnist for The Indianapolis Star after a post on old cookbooks. Costa Rica is doing fine, great weather, good sales, and finally getting out to the woods. Thanks for the excellent post, Doug! I’ll add another use for the ‘simmons: after running them through the food mill, put the seeds and pulp in a quart or two of water, cover the jar with a cloth, and leave on the counter for a couple days. Once it gets nice and bubbly from all the yeast living on the fruit, strain out the fruit stuff and stick the drink in the fridge to stall the fermentation. This persimmon fizz is best enjoyed on a sunny fall afternoon after a morning spent busily squirreling up acorns and walnuts. As an added bonus, the soaking and fermenting helps to loosen the pulp from the seeds. 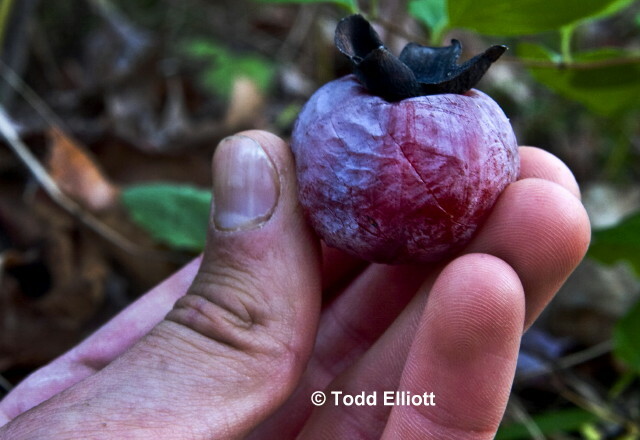 Thanks Doug – we discovered wild persimmon for the first time this year! They were so delicious we made persimmon pudding and did a bunch of research into it’s herbal use in Chinese medicine. Whew-wee, make hay all winter? Now that’s a warm winter! What if you bite more than one seed and get a conflicting report?